My first impressions were that this was a well-made, strong tool that would tackle anything. The unit I received came with a stepped handle, but you can also buy the blade separately. The blade has a large flat section which leads to a shaped form end which is designed to reach into hollow forms to undercut the body section safely. The tip - made from TCT - is quite small at just over 10mm (3/8in) diameter, and is also replaceable. 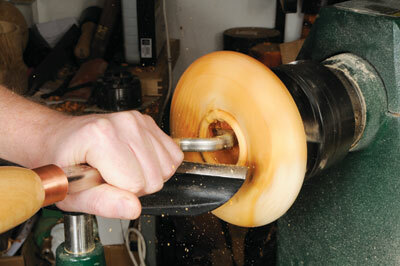 I mounted the blank on the lathe, opened up the centre section then used the tool to undercut the hollow form. I followed the directions, kept the flat section on the toolrest and found that the tool cut very well indeed. Don't force the tool; the cutter removes a lot of wood very quickly and when an area is blunt, undo the screw and turn the cutter around a bit to expose a fresh edge. I used the tool with various overhangs of the cutting edge past the toolrest and found that at its farthest reach, it could have done with a bigger handle to resist the lifting during the cut - so you can tuck it under your arm - but at no time did I encounter blade vibration. The blade-only option may be better for those who are likely to utilise the full capacity of the tool. Like all tools, it takes a little getting used to but it cuts well and does exactly what it says it should. But take care; if you drop a disc in the wood shavings then you have lost it for good. Overall, the Easy Hollower is well made and a delight to use, but it does take time to get used to it. However, once you have mastered the tool, I don't think it will be too far from your lathe. 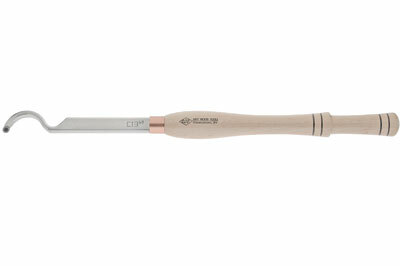 The Ci3-h5 Easy Hollower is well made and certainly is a very stable tool to use. The large, flat section provides excellent support during cutting and resists the rotation of the tool well during the cut. The handle is comfortable to grip, but I agree with Martin that a larger handle would be great for the larger reach work. The cutter cuts well, and the tool does not seem to mind whether the wood is side or end grain, wet or dry. I think the price may be a bar to some people, but all in all, this is a good tool to look at if you want to create hollow forms.